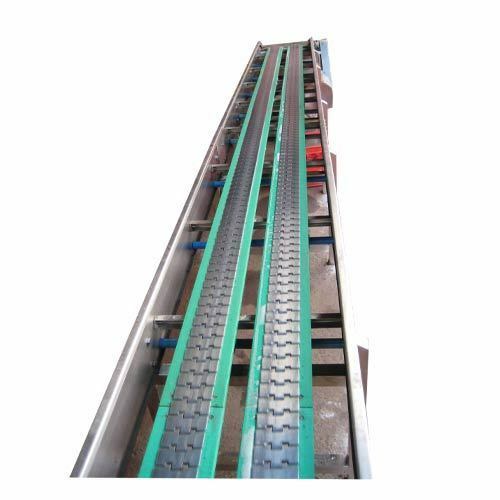 Two Row Slat Chain Conveyors are used for the controlled movement of a large variety of both regular and irregular shaped products. They can move light, fragile to heavy and rugged unit loads on a horizontal or inclined path within the limits of product stability. Our rich industry experience and process expertise have enabled us in manufacturing and supplying Conveyor Systems, Take Off Conveyors, Printing Conveyors, Loading Unloading Conveyors, Roller Conveyors, Truck Loader Conveyors, Chain Conveyors, Ninty Degree Magnetic Bed Slat Chain Conveyors, Two Row Slat Chain Conveyors, Slat Chain Conveyors, Side Wall Cleated Belt Conveyors, Belt Conveyors and Inclined Belt Conveyors. These are made of high grade material and available in numerous technical specifications as per the requirements of our customers. Known for optimum performance, excellent quality and low maintenance. Our range of Industrial Conveyors are widely demanded in various industries. We are looking queries from all over India. In our organization, quality is strictly followed in all our business undertakings. A team of quality controllers is employed by us who take care and ensure that defect free products reach our customers. Before supplying, our range of Industrial Conveyors is tested on various quality parameters like construction, performance, resistance to corrosion, maintenance level and durability.